Bloomberg Media made a case to advertisers today that it could target consumers of various generations across distribution platforms at its first Digital Content NewFronts presentation. Part of the 34-year-old media company's pitch revolved around a message that suggested we're all acting like smartphone-toting, swipe-happy millennials now—even business news aficionados. "It's like Tinder for video," said Bloomberg Digital chief digital officer and editor Joshua Topolsky, describing the company's new offering—Responsive.TV. "You do fall in love every once in a while." Topolsky's comments amused a packed house of a few hundred marketers, but the point made by the former editor in chief of The Verge was apropos for a media conglomerate wanting to show it's in tune with the zeitgeist—a challenge for all traditional media brands. So while Bloomberg unveiled several new series and ad products, Responsive.TV received the most stage time at the New York event. Bloomberg has partnered with agency Stinkdigital to create Responsive.TV, which is designed to give digital viewers more flexibility in terms of how they consume video, whether it's repurposed television or digitally dedicated clips. Specifically, it's going to offer the quick bursts of information Topolsky alluded to with his Tinder analogy. Since Bloomberg learned, via surveys, that 45 percent of its audience doesn't want long video, Responsive.TV will cut up clips into small pieces. "What's the best way to tell the story, and what's the best platform to tell it on?" said Paul Caine, chief revenue officer at Bloomberg, explaining the platform's mission. "We don't think [of ourselves as] television or digital first." Let's break down the other components of Bloomberg's presentation. B:Intent is designed to place brands in a more accurate context when it comes to the mindset of viewers. For example a hospitality brand or airline wouldn't pay to appear near an internationally-themed video being consumed for entertainment purposes. Instead, such marketers would be seen alongside pieces educating viewers about destinations—and therefore more likely to be in a booking mindset. The behavioral-data-powered algorithms will make these distinctions in terms of ad placement, explained Zazie Lucke, global head of marketing at Bloomberg Media. And referring to such targeting and Bloomberg's well-salaried demographic, COO Jacki Kelley called the advertising opportunities "the most desirable audience you can buy." Bloomberg Media Studios will offer creative services directly to global and national advertisers, helping develop content that will have more of a native-advertising feel. When pressed about keeping editorial integrity intact with native ads, Bloomberg Media founder Mike Bloomberg answered, "We have to make sure there's a clear distinction between the two, and we have to make sure that distinction doesn't take away from people wanting to look at the advertisement." Bloomberg Premiere ads will be full-screen, take-over spots that could appeal to TV and movie marketers. 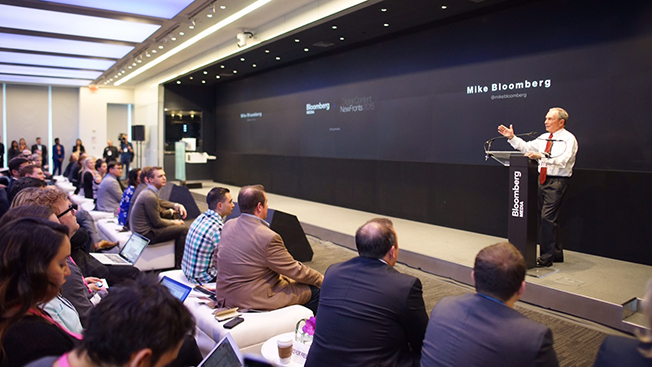 Innovation Sessions is a hands-on workshop for advertisers, who can sign up for two-hour sessions with Bloomberg's technologists, creatives and data scientists to craft branded stories. "The idea is to do them every week for as long as we have the interest—which we expect to take us through this summer," said Lucke. "We'll sit down with our head of creative, our head of data and do an hour-long meeting with a certain agenda. The idea is to crack the nut of where a particular brand should be going with their video strategy. The idea isn't in any way to replace the agency but to complement what they are doing." Those ad products will be implemented in the following four Web-based shows Bloomberg also revealed. The Morning Brief is a daily video about important international stories intended to prepare readers for the business day ahead. The content will vary from region to region worldwide. The Market Close will consist of short-form video anchored by the journalistic perspectives of its hosts, Joe Weisenthal and Alix Steele, and supplemented by Bloomberg's stock market data. The Spark is a digital original series that profiles emerging businesses and technologies. PricewaterhouseCoopers has bought this program's first sponsorship, Lucke said. Handmade is a series celebrating craftsmanship around luxury items. Bloomberg's sales team has a lot of work to do if the dearth of ad partners announced today is any indication. "This being our first NewFront, I think it's about starting conversations, quite frankly," Lucke said. "Ideally, that conversation will snowball and evolve into the completion of sales." And given how so many consumers nowadays want their videos short and sweet, closing such sales may come down to convincing brands that Bloomberg has found the sweet spot—in the words of Caine, the company revenue chief—"between The New York Times and BuzzFeed."